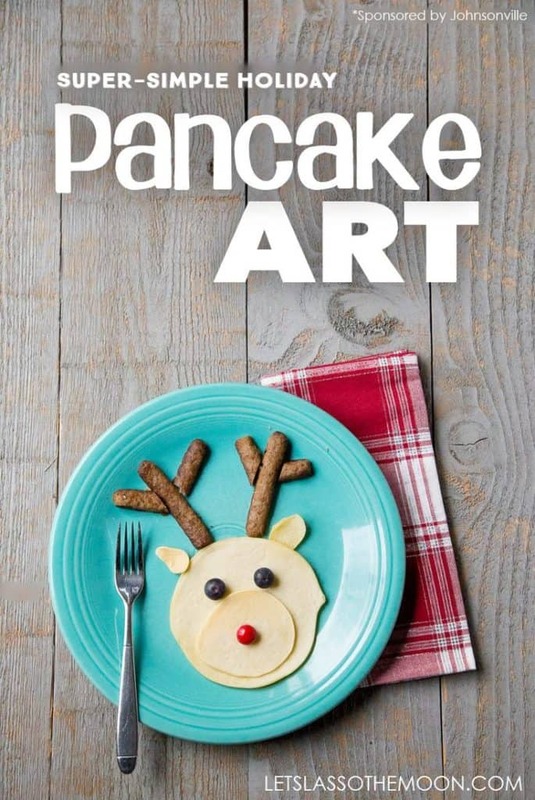 Christmas Pancake Art: 5 Holiday Designs Perfect for Little Chefs! Christmas Pancake Art: 5 Easy Holiday Designs *Anyone* Can ROCK — Including Kids! These five Christmas pancake art designs are so simple, anyone can ROCK them — even the kids. This is the perfect family holiday tradition the week of holiday break. 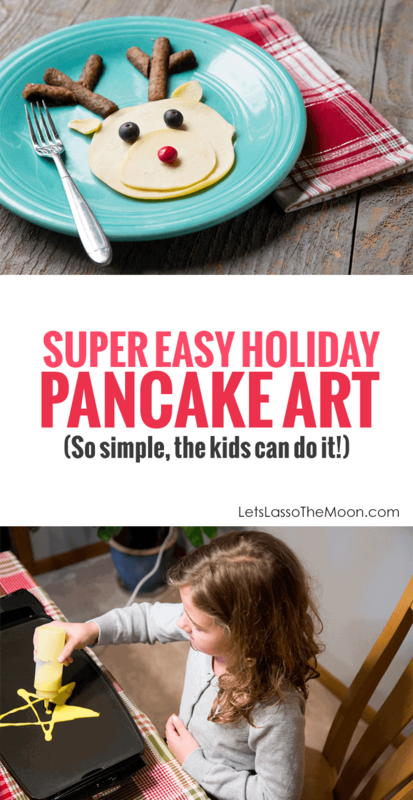 Making Christmas Pancake Art is the perfect family activity for a December weekend. It is also a wonderful way to celebrate Christmas morning with kids. Try it once and you’ll be hooked. Common Sense Disclaimer: The pancake flat iron is EXTREMELY hot. You know your children and their capabilities better than anyone else in this world. Use your parent judgement to decide when your child is capable of this kitchen task. Below are five of our family’s designs from a Christmas Pancake Art session we did over “breakfast for dinner” this weekend. 1. Christmas Pancake Art: Trim the Tree! Let’s get start with a basic Christmas tree. You can keep it a simple triangle or get a bit fancy with the outline, it is up to you. My husband is alway a bit slow in joining the fun, but usually ends up amazing us with a design that *looks* complex, but is actually super simple. AKA: This adorable Rudolph reindeer. We made this reindeer two ways. Once, with blueberry eyes and a raspberry nose. And another time with chocolate chip eyes and a red M&M nose. Both were delicious! When we make Pancake Art, we always use this pancake-crepes recipe for the batter. It is nice and thin, tastes great, and is easy to work with. Be sure to whisk all those pesky lumps out of the batter. Set your griddle at 375 degrees (or your pancake pan to medium-high) to allow yourself a little time to work your magic. This temp allows the batter to set properly, but still gives you leeway to play around. I recommend using plastic squeeze bottles for your colored batter. There are more expensive options, but these do just fine! You can order bottles online or usually find them in either the kitchen section or cake decorating section of your local store. 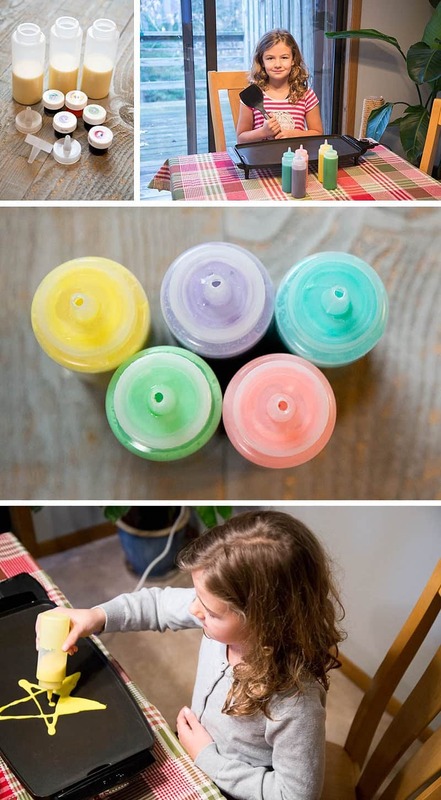 Start by scooping batter into a liquid measuring cup, add the food coloring, stir until mixed, and then pour the colored batter into the plastic squeeze bottles. We like Wilton Icing Colors because of the variety of shades. *If you’re not keen on using food coloring, use berries for a natural dye option. A little nervous? Don’t fret. 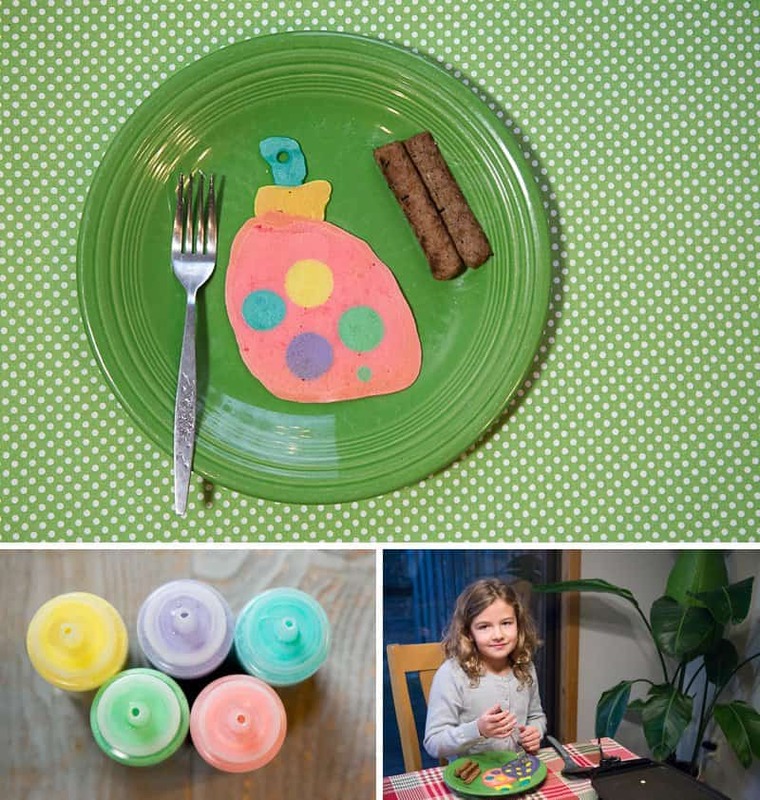 Check out the PANCAKE ART DESIGN TIPS I share in this sponsored post for Johnsonville Sausage. Honestly, it is not as challenging as it looks. I promise! My girls (currently 9 & 10) can make some pretty cool Christmas Pancake Art on the griddle. 4. Christmas Pancake Art: Let it Snow! I wanted to show you this video, because my first attempt was an epic fail. Watch for the bloopers at the end of the video. Lesson learned! We simply encased the second version of the snowflake within a circle. Easy-peasy. This last design is another simple idea from the kids. If you do decide to add Christmas Pancake Art to your family’s holiday to-do list, we’d also love to see your family’s designs! Be sure to share them with us on Facebook here or tag me at @letslassomoonlight on Instagram. P.S. Follow my Creative Family Kitchen Pinterest boards for ongoing kitchen inspiration. « MOM QUIZ: You need to know your score! Do you deserve a momcation?